A map contains values on the basis of key, i.e. key and value pair. Each key and value pair is known as an entry. A Map contains unique keys. A Map is useful if you have to search, update or delete elements on the basis of a key. A Map doesn't allow duplicate keys, but you can have duplicate values. HashMap and LinkedHashMap allow null keys and values, but TreeMap doesn't allow any null key or value. A Map can't be traversed, so you need to convert it into Set using keySet() or entrySet() method. 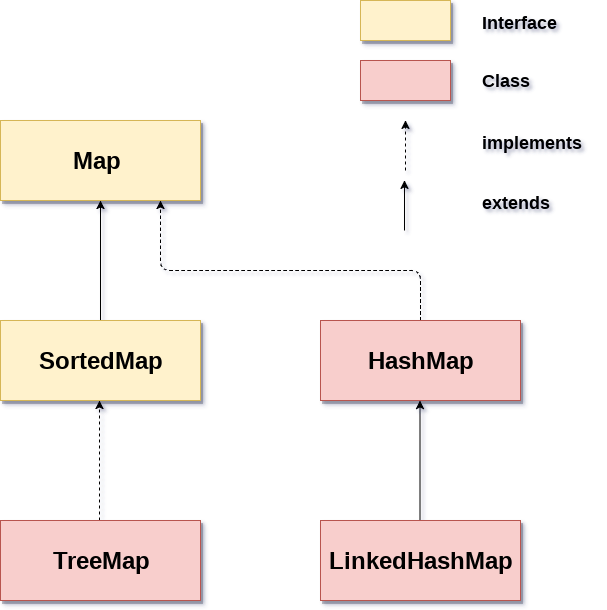 HashMap HashMap is the implementation of Map, but it doesn't maintain any order. LinkedHashMap LinkedHashMap is the implementation of Map. It inherits HashMap class. It maintains insertion order. TreeMap TreeMap is the implementation of Map and SortedMap. It maintains ascending order. V put(Object key, Object value) It is used to insert an entry in the map. void putAll(Map map) It is used to insert the specified map in the map. V putIfAbsent(K key, V value) It inserts the specified value with the specified key in the map only if it is not already specified. V remove(Object key) It is used to delete an entry for the specified key. boolean remove(Object key, Object value) It removes the specified values with the associated specified keys from the map. Set keySet() It returns the Set view containing all the keys. Set<Map.Entry<K,V>> entrySet() It returns the Set view containing all the keys and values. void clear() It is used to reset the map. V compute(K key, BiFunction<? super K,? super V,? extends V> remappingFunction) It is used to compute a mapping for the specified key and its current mapped value (or null if there is no current mapping). V computeIfAbsent(K key, Function<? super K,? extends V> mappingFunction) It is used to compute its value using the given mapping function, if the specified key is not already associated with a value (or is mapped to null), and enters it into this map unless null. V computeIfPresent(K key, BiFunction<? super K,? super V,? extends V> remappingFunction) It is used to compute a new mapping given the key and its current mapped value if the value for the specified key is present and non-null. boolean containsValue(Object value) This method returns true if some value equal to the value exists within the map, else return false. boolean containsKey(Object key) This method returns true if some key equal to the key exists within the map, else return false. boolean equals(Object o) It is used to compare the specified Object with the Map. V get(Object key) This method returns the object that contains the value associated with the key. V getOrDefault(Object key, V defaultValue) It returns the value to which the specified key is mapped, or defaultValue if the map contains no mapping for the key. boolean isEmpty() This method returns true if the map is empty; returns false if it contains at least one key. V merge(K key, V value, BiFunction<? super V,? super V,? extends V> remappingFunction) If the specified key is not already associated with a value or is associated with null, associates it with the given non-null value. int size() This method returns the number of entries in the map. Entry is the subinterface of Map. So we will be accessed it by Map.Entry name. It returns a collection-view of the map, whose elements are of this class. It provides methods to get key and value. K getKey() It is used to obtain a key. V getValue() It is used to obtain value. int hashCode() It is used to obtain hashCode. V setValue(V value) It is used to replace the value corresponding to this entry with the specified value. boolean equals(Object o) It is used to compare the specified object with the other existing objects. static <K extends Comparable<? super K>,V> Comparator<Map.Entry<K,V>> comparingByKey() It returns a comparator that compare the objects in natural order on key. static <K,V> Comparator<Map.Entry<K,V>> comparingByKey(Comparator<? super K> cmp) It returns a comparator that compare the objects by key using the given Comparator. static <K,V extends Comparable<? super V>> Comparator<Map.Entry<K,V>> comparingByValue() It returns a comparator that compare the objects in natural order on value. static <K,V> Comparator<Map.Entry<K,V>> comparingByValue(Comparator<? super V> cmp) It returns a comparator that compare the objects by value using the given Comparator.